A Handyman is a skilled person who undertakes different types of home repairs and home improvement jobs such as Kitchen Remodeling, Bathroom Remodeling and Basement Finishing. They generally rely on their experience though some might also be certified. Handymen are largely self-employed but many companies offer very organized handyman services and have a number of them on board. Calvert Handyman offers top-of-the-line handyman services and offers the necessary guarantees for all the work that is carried out by our expert personnel. We will estimate the job, provide you with a written estimate and carry out the work to your satisfaction. Woodwork & Carpentry-Handymen generally undertake a variety of basic wood-work tasks, like installing interior trim such as baseboard, chair rails, or crown moulding, installing of shelves and repainting/sanding damaged window frames. 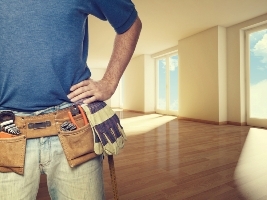 A handyman may also install wood flooring, perform any grouting work and install new tiles in bathrooms and kitchens. They also adjust hinges on doors and align them. Painting and Decorating-Most handymen offer drywall services. This involves hanging drywall and preparing them for painting. A handyman also handles painting jobs and will paint walls, paint window frames, doors and baseboard and crown moulding as required. Plumbing-A majority of houses will have plumbing problems at one time or the other. There may be a leaky faucet or pipes leaking. There could be clogged drains in the bathroom or kitchen sinks and all these jobs can be handled by handyman. It is important to get leaks fixed without delay as they can damage the structure of the house, if they are left untreated. Most handymen can also sort-out all the basic plumbing complaints and can also install toilets and faucets. Our handymen can also install appliances like dishwashers or even washing machines and replace or repair guttering around the perimeter of a house. Electrical Work-However, a handyman can perform a variety of minor tasks that involve electrical work like removing replacing older switches or even hanging a ceiling fan. They are also able to install new electrical outlets that are used for electrical appliances. Safety Work-Home safety is another area that a handyman can help with. They can change locks to the interior doors in your house as well as safety latches on the windows. They can test as well as install smoke alarms and carbon monoxide detectors. They can also install motion-sensor lighting or even the surveillance cameras that are so essential for maintaining safety around your home. Handymen also undertake miscellaneous home maintenance services and property maintenance such as hanging brackets and nails that help with heavy mirrors and picture frames. They can also help in hanging wall-mounted TV’s and assemble flat pack furniture or hang blinds and curtain. In short, a handyman is a jack-of-all trades and it is important to keep the number of a skillful and reliable handyman, easily accessible as you will never know when you might need it.